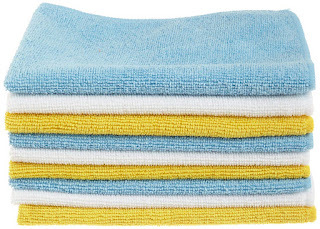 Right now over at Amazon you can score this 48-count pack of AmazonBasics Microfiber Cleaning Cloths for just $11.87 shipped (Retail $24.99) when you opt to Subscribe and Save – that's just 25¢ each! In addition, you can snag this 144-count pack of Cleaning Cloths for just $31.56 shipped (regularly $49.99) when you opt for Subscribe and Save – that's just 22¢ per cloth! These highly rated microfiber cloths are non-abrasive so they won't scratch surfaces. Plus, they can absorb up to eight times their weight. They come in blue, yellow and white so you can designate them for separate uses too!